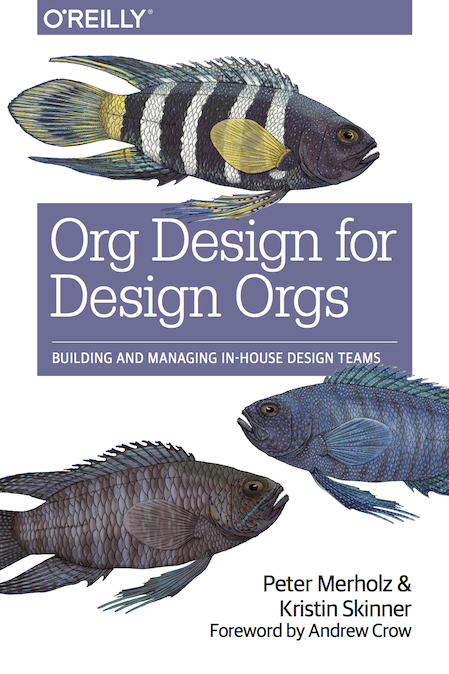 It’s been about two years since Org Design For Design Orgs came out. After having worked with it, taught it, and spoken with many design leaders and seen many design orgs, there’s a list of things I know I’d want to address if we wrote a second edition (note: no plans to do so). In the “evolution of design organizations,” go beyond stage 5, to at least stage 7. We charted 5 stages of organizational evolution, from the “initial pair,” all the way to “distributed leadership,” where there’s about 70-80 people on the team. We yadda-yadda’d beyond that, saying, “just keep doing this, but more.” Since writing the book, there have been an increasing number of design teams that go beyond 100, and it’s clear that there are patterns in that development. It’s worth addressing what comes into place when the team hits 150 (stage 6), as that’s when Design Operations / Design Management becomes quite robust, and again when it gets to about 250 (stage 7), where it can support deeper craft leadership, “principal” or “distinguished” designers, and also when it’s time to consider–should it remain as a single centralized org? Dig into the crucial role of the Team Lead. In chapter 4, we dedicate a page to the role of the Team Lead, including the line, “the best team leads are a combination of coach, diplomat, and salesman.” That line became the seed for my talk on design leadership, and the process of writing that talk, and sharing these ideas at conferences and inside companies, has shown me that there’s much more to share about this crucial role. In fact, I consider it the most important role in a design organization, more than any VP or Director. (That will be the subject of a future post on this site). Go deeper on Design Operations / Design Management as a role and practice. Though the book has been called “the bible of design operations,” we don’t really tackle Design Operations / Design Management head on in a thorough way, particularly around matters of Program Management (budgeting, scheduling, coordinating efforts), Education (internal training and skills building), and Measurement (tools, systems, and approaches for understanding the impact of the work). Do a better job distinguishing between Product and Communication Design. In our utopian desire to merge all design activities under the rubric of “service design,” and have product designers and communication designers working side-by-side on design teams, we neglected to delve into the very real differences between delivering product design and communication design. They operate on different cadences, work with different parts of the organization, and most of their time, simply don’t interact. That said, there is real value in having product and communication design on the same team (it was essential when we rebranded Snag). This is still a point of contention for many design orgs, and so warrants more honest, pointed discussion rather than our hand-waving of “it’ll be great”. Soft power as a tool for distributed teams. However much I believe a centralized design organization to be the right way to go for, like, 95% of design teams, the reality is that many function in some kind of distributed, federated, siloed fashion. For those organizations, I’ve been applying the notion of “soft power” as a tool to get these distinct design teams aligned with a common goal, purpose, and set of practices. Even more about recruiting and hiring–Portfolio Assessment Tool and design exercises. Even though it’s the longest chapter in the book, it turns out there’s still more to say about recruiting and hiring practices for design. The community still is at odds about the value of design exercises (though we’re not). Also, since writing the book, I’ve had the opportunity to craft a Portfolio Assessment Tool that brings a needed level of rigor to the practice–a clearer set of prompts to guide the discussion, and a guided worksheet to aid people in assessing a portfolio as to remove bias and focus on the content of the work. So, these are the ideas I’ve had. And I’m sure Kristin has a bunch of things she’s considering. And I am wondering: for those who’ve read the book, what more could we address that would help you?